Oh Charlene! It look like love! Could anything be any sweeter??? Not that I've ever been surprised by it, but this shows a good part of why your fosters turn out to be such wonderful kitties. They've got you an Craig for the 'living with humans' side of their socialization, and Charlene as their substitute kitty mom. You have to keep these two!!!! 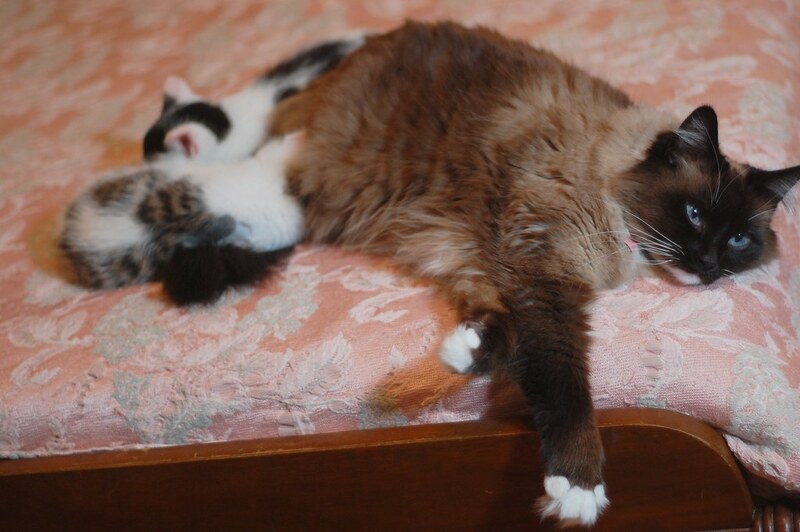 It must be so soothing to all your fosters to have such a nurturing big sis. No wonder they turn out so great. This is officially the cutest post ever! Butterbean is the best! As much as I love seeing the itty bitties, Charlene is def the best part of your family! Maybe I missed an explanation, but -- aren't male calicos rare? And isn't one of your boys a calico?? If this was already addressed, I missed it ... they are SOOOOO cute! THAT's what we've all been waiting for! love Walter's starburst toes in the fifth pic. 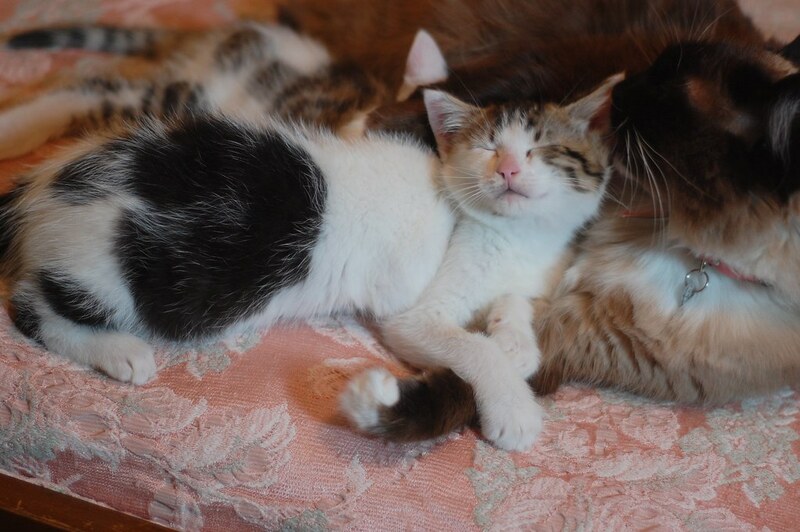 What a loving foster mommy. She's giving them a good start. that is quite the wonderful fostermamabean you boys have! That is so sweet!! Love the pictures!!! What a great fosterbean. Poor little Ira keeps getting this look on his face like, "I want some toooooooooooo!" Anne,, Walter's not a calico,, he's a "tabby and white". So much cute that words fail me. 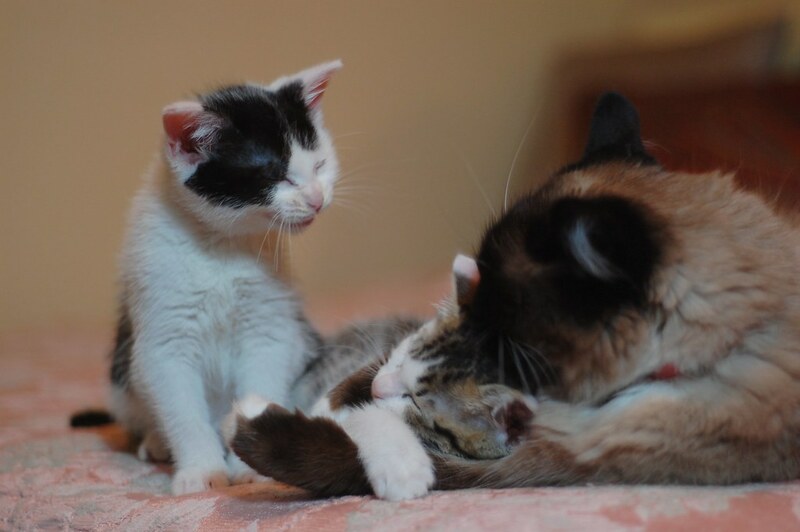 So gorgeous, what a gentle foster mum she is. Love the little jazzhand in picture #5.. Such utter, sweet ecstasy! And Ira looks like he's enjoying a good laugh in picture #7. I am ded from the kewt.. blargh. but...anne and laurie - he's still a TRI-color, which IS rare. right? anyway. ira is TUGGING at my heartstrings. i died. dead. right here. too cute. can't stand it. A true tricolor must have one of its colors derived from the red gene -- either red (orange) or cream (kind of a light, orangy beige, not unlike the color many people call "ginger"). If it does not have one of these two colors, it is not a true tricolor. The second color must be white, and the third color must be black, blue (a blue-gray), chocolate, lilac (a pale rose-beige), cinnamon, or fawn (a pale buff color). Black and blue are by far the most common. 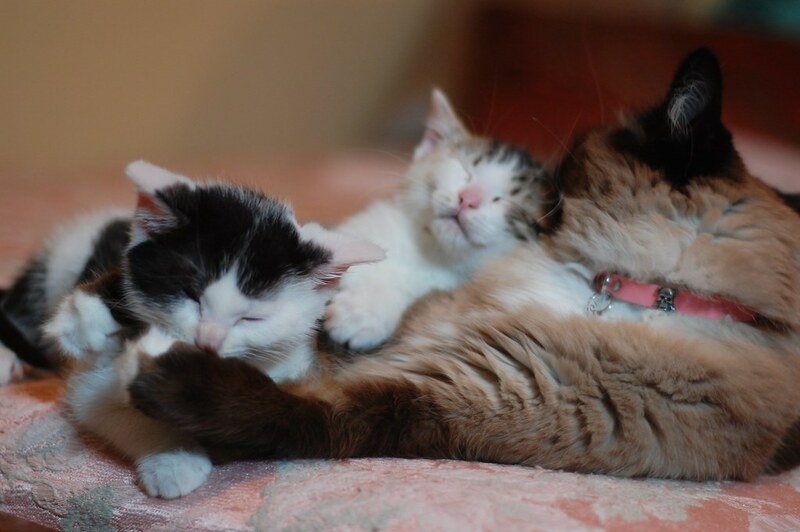 Some cats may appear to have three colors, but in fact may only have two. There is a designation called "bicolor" where the cat has a significant portion of white fur, but the rest of the cat is either a solid color such as black, blue, red, or a patterned color such as brown tabby, silver tabby (what many people call "tiger"), blue tabby, etc. A white cat with patches of tiger stripe might appear to have three colors -- white, black, and gray -- but because one of the three colors is not red or cream, it is not a true tricolor. It's defined (colorwise) as a tabby and white. A white cat with red or cream tabby patches is not a true tricolor either; only one of the colors may be red or cream in a true tricolor. Such pictures of bliss! Squeee! 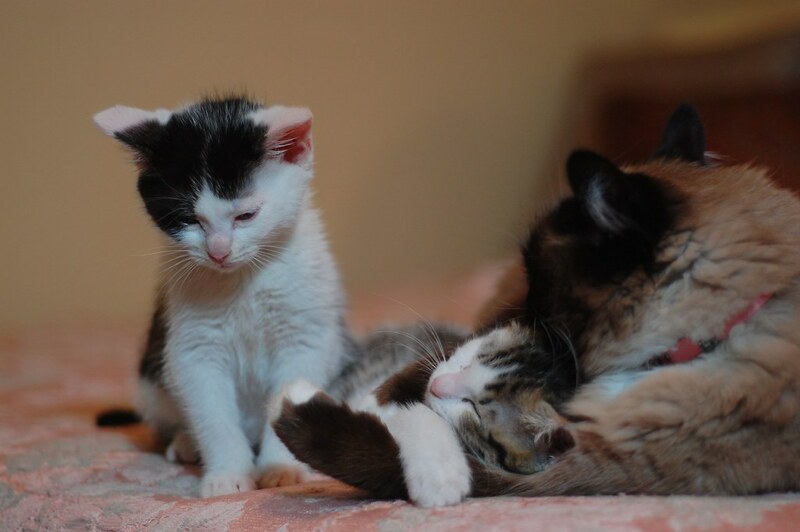 No wonder IBKC kittens turn out so well, between the care and hugs you and Craig (and your Mom & Dad) give them, Charlene's lovin', and Ms. Drewey's lessons on Being a Proper Cat! And here we have a fine and true example of The Bean's Full Nelson Tongue Bath (tm) in action! Yes, all kittens are special. But is it me? Are the Finch boys extra extra special? I think so. And of course, the Bean is Queen. Awen,, all kittens are special. I think this time, because it's just a pair and not a full litter, we've just spent more time with the boys. Our attention wasn't so divided. Also, we've all been through a lot with them. Going through illnesses with pets (and people) brings you closer. So Cute!! I can't even keep upright because I am falling down from the cute!!! Ira, sweetie, Charlene is a somewhat fickle girl. I'm certain you'll be the most favored one tomorrow, you'll just have to wait a wee while. For now, Walter's looks of bliss as he's draped over the Bean's arm are too darned cute for words. Sigh. Sooooo adorable! I love little Ira's expression during his bath. Utter bliss. Nothin' better than a Bean'n'bed, eh, boys? Oh Charlene, you are just the best stepmom in the world! 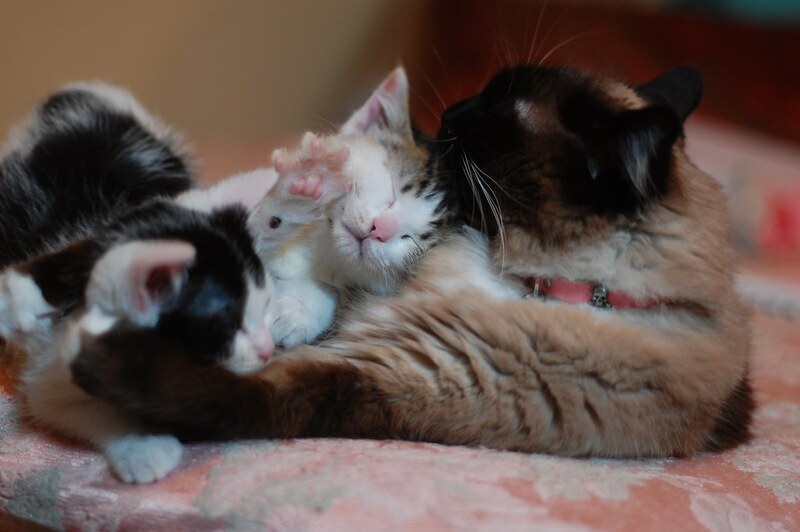 I hope all of your many kittens appreciate your love. I sure do. This reminds me of our big cat, Chico. We've had two kittens other than him since we got him--one we had to give away because of apartment policies. :( But both times we brought the kitten home, he spit and howled and glared, and mewed at us pathetically, like "Why did you bring this home? You already HAVE a perfectly good cat!" 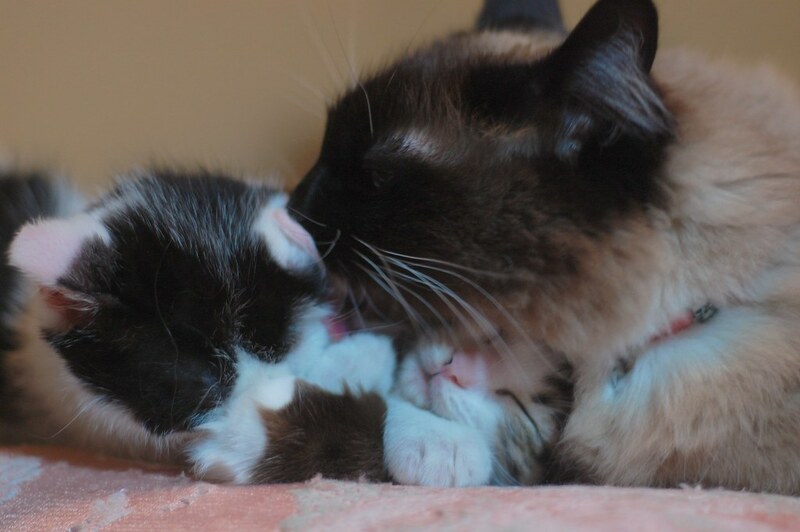 But, eventually, he was reduced to these photos: mothering, mothering, mothering. He bats the kitten when she does something bad (gently, of course), and howls for us when she needs assistance, and washes her ears. It's so cute it's almost too much. Oh such happy contented photos. They made our day! Smoochies. 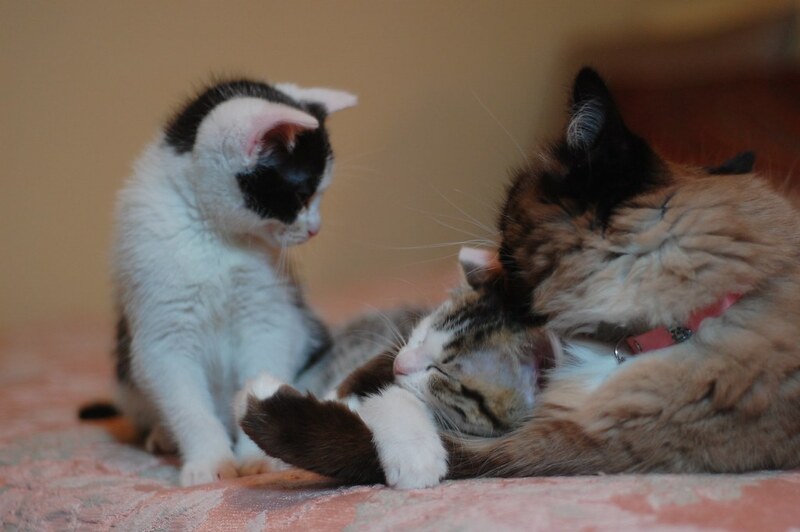 Looks like Miss Bean knows that these two need a little extra loving to make sure they grow up big and strong! Oh, Charlene, what a sweetheart you are! Oh, I hope those Finch boys know how lucky they are to have such a good Auntie Bean! It's like they're magnetically drawn together. These are almost unbearably sweet. How lucky the babies are, to have Charlene's nurturing influence in their lives. Bean pics are my favorite. 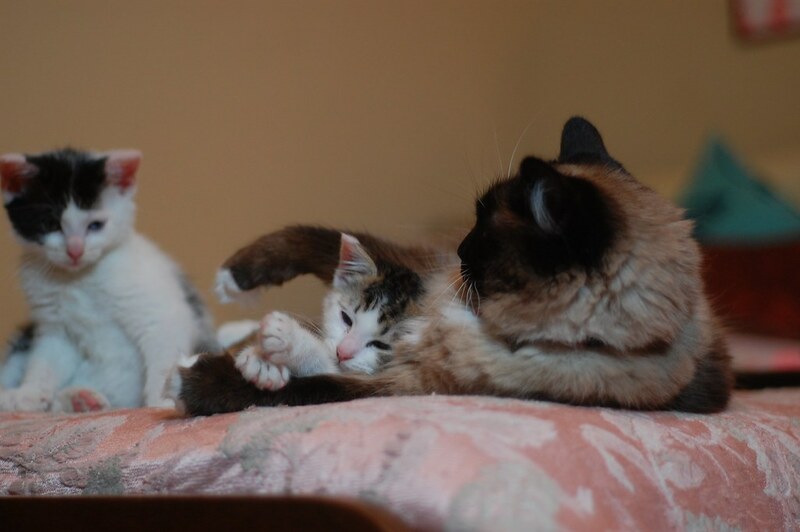 Laurie, thanks for that explanation on tri-color, bi-color, and tabby and white. I had been wondering about Walt myself. If I can be so annoying as to ask more questions... Walter's tabby portions look red and black to me. Is that a trick of the monitor? Is he really black and chocolate or something? And while I understand about the genes having to be present, if a cat looks like it has ginger or red, as Walter does to me, how would one know that the gene is not present without expensive genetic testing? Anon,, his tabby patches are brown and black. soooo sweet! 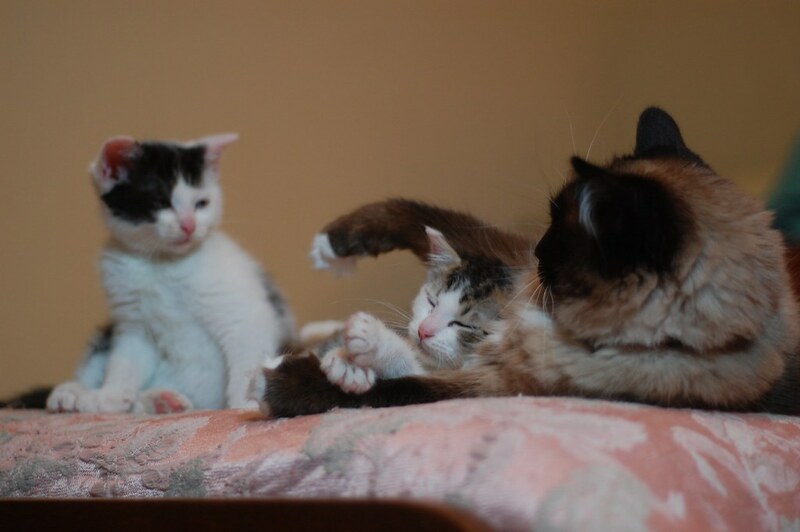 I'm so happy to see these babies look happy and so much healthier than a few weeks ago - yaaay kittens! 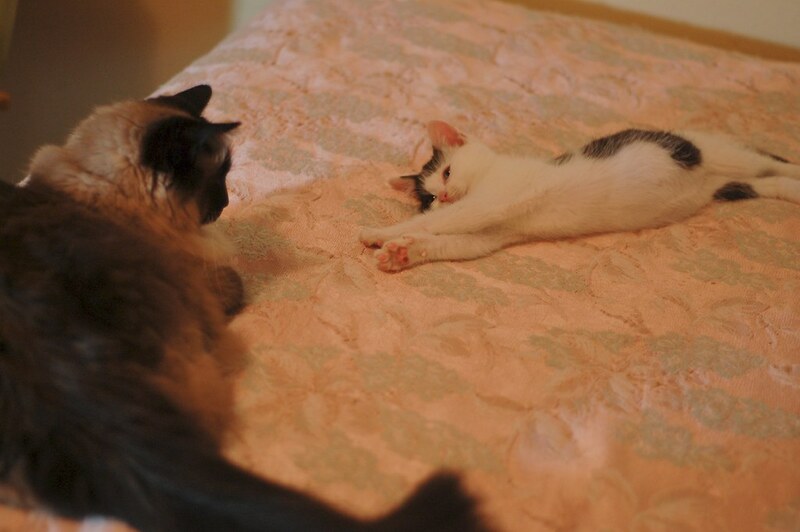 And Butterbean - what a perfect foster kitty mom you are! gotcha! and just as i was about to say "but..." a brown tabby popped up on the right side in the adoptions box, and i went "ooooooooh......" i think it's cause he has SO much white that it's throwing me off. Those pics are adorable! I just added a dog to my household and one cat hates the dog and the other could care less. I hope I can get some snuggle pictures once they get used to each other. Seeing this brings tears of joy to my eyes. 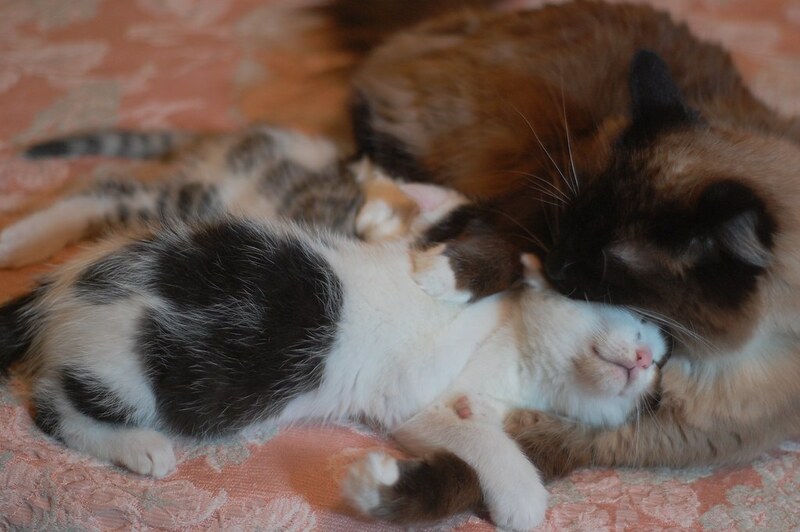 This is the most wonderful thing in the world to see cats love and be loved! I don't know what makes it so satisfying to see Charlene mother kitten after kitten, or to see the kittens obviously cleave to her, but darn it, it sure IS satisfying! I love all the photographs, but I particularly love the ones where Charlene deploys a big, floofy white-gloved mitten to snare a kitten and dispense her love. They can't escape, but they don't want to! 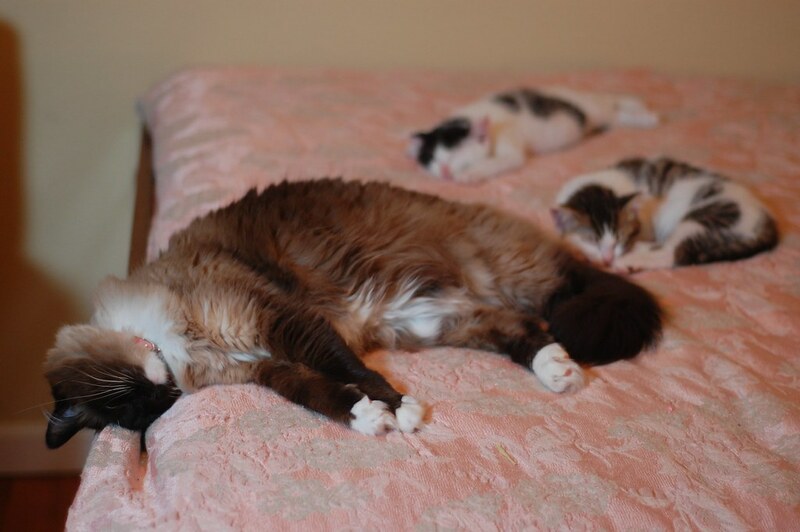 Oh Ms. Bean you are so good to the kittehs! Love the photos of you three! !